PARIS, Jan. 23, 2019 /PRNewswire/ -- WeChat Pay and BHV Marais are joining forces to launch a smart department store solution, including an innovative pop-up store celebrating Chinese New Year in the heart of the Marais district in Paris. 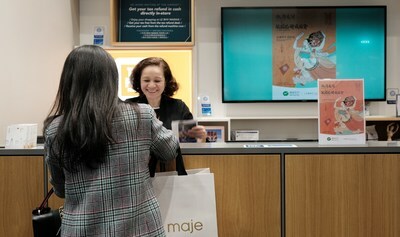 By introducing smart and sustainable solutions through WeChat Pay, BHV Marais will provide its Chinese guests with more diverse and personalized products and services, whilst giving them access to its iconic shopping experience. This cooperation marks WeChat Pay enhancing its effort in helping European businesses connect with Chinese tourists to realize WeChat's ONE FOR BILLION initiative. ONE FOR BILLION is the latest initiative of WeChat Pay cross-border business. WeChat has over 1 billion monthly active users around the world, while WeChat Pay has 800 million monthly active users, making it the most widely used social network and one of the most popular mobile payment platforms among Chinese people. Integrating a wide range of WeChat capabilities including payment, Official Accounts, Mini Programs, social media advertising and more, WeChat Pay provides merchants with not only an advanced mobile payment method but also a platform which enables long-term communications and customized customer services for billions of Chinese consumers. Commenting on this announcement, Amandine de Souza, BHV Marais CEO, declared: "For the past two years, BHV Marais has developed an increasing number of intiatives to better cater to its international clients, with a special attention on China. Following the recent implementation of WeChat Pay within our Parisian flagship, we are delighted to further our engagement by organizing this unique event with them." According to statistics from China's Ministry of Culture and Tourism, 147 million Chinese tourists travelled abroad in 2017, spending a total of US$220 billion. According to estimates by the French Tourism Development Agency, China will become France's second largest source of tourists after the United States, with an estimated number of Chinese tourists visiting France reaching 2.3 million in 2018. However, differences in language and consumption habits often affect the overall travel experience of Chinese tourists. For merchants, payment limitations and failure to accurately communicate attractive marketing information can potentially put off customers, and greatly reduce the efficiency of overall operations. It can be difficult for businesses to gain customers from the huge pool of Chinese tourists. Thus, WeChat Pay has been regarded as a magic wand attracting Chinese customers with its extensive capabilities. Freedom Li, President of WeChat Pay International Business, says: "Smart industry solutions with WeChat Pay at their core have been brought to millions of offline stores across over 30 industries in China, and are common throughout users' daily lives. Many Chinese people have now long been accustomed to going out without their wallet. Together with our global partners, we hope to extend the convenient experience of WeChat Pay overseas, so that global businesses can share the dividends of China's growing outbound travel market." At present, WeChat Pay's cross-border payment service has entered 49 countries and regions outside mainland China in line with local regulations and has achieved deep penetration in regions such as Southeast Asia, Japan and South Korea. It has set up more than 100 WeChat Pay smart flagship stores and successfully created a variety of solutions including smart theme parks, smart airports, and smart restaurants. In 2019, WeChat Pay will launch a comprehensive plan for the European market, dedicating more investments to help European merchants continuously improve their service capabilities for Chinese customers.